You just created your Dashlane account! That's great but now you need some help getting started. We'll break down the basics on how to get started with Dashlane. You'll be "Dashlaning" in no time. If you are a Linux/Chromebook user, please click here for help Getting Started with Dashlane. You don't need to add all of your passwords right away. To get started, you can add your most-used passwords, or use any one – or all – of the methods described below. The Inbox Security Scan scans an email address you provide and produces a custom analysis of the online accounts you created using that address. You may be surprised by just how many accounts you have! Some new users are automatically prompted to try out the scan. But if you weren't prompted or skipped the process at the time, you can launch it by tapping on "Inbox Scan" from the Tools menu on iOS (below, left) or in the main menu on Android (below, right). See How to use Inbox Security Scan to load your accounts into Dashlane for more details. On Windows: Your passwords will be automatically imported from your browsers, but you can manually import them if you need to. Select any browsers you'd like to import credentials from. You may also import from other password managers from this menu. iOS/Android: At this time, data cannot be imported from iOS or Android browsers. Please use Dashlane on Windows or macOS to import data from your browsers, from another application or from a CSV file. On a mobile device? This method works a little differently there so please visit Auto-Login for Android or Auto-Login for iOS to learn more. Make sure your Dashlane browser extension is installed and on. In your browser, the shield icon will be outlined in the color teal (unless you use Safari - where the Dashlane icon should be dark gray - or Internet Explorer - where the extension will come with a green dot). If you are not sure you have the extension or if it is not working properly, please click here. Browse the web and log in to sites as you normally would. When you log in to a site that isn’t yet saved in the app, it will ask you if you’d like to save it for future use. Click Save when Dashlane asks if you want to store it and you'll be automatically logged in next time! Note: If you log in to an account that’s already stored in Dashlane with a different password than what Dashlane has saved, the app will ask you if you’d like to replace it. This makes sure you always have the right passwords in Dashlane (especially when you reset them). Open your Dashlane application and select 'Passwords' from the left-hand menu. Fill in the blanks for your credential. Typically, the Website, Login and Password fields are necessary. On a mobile device? This feature works a little differently there so please visit Auto-Login for Android or Auto-Login for iOS to learn more. Before we move on, your Dashlane browser extension needs to be installed and on for this to work. If you do not have it or aren't sure, get it here. Now that you've added your credentials to Dashlane, you'll log in to all your web accounts with one click. When you visit a website, look for the blue impala in empty fields (if the impala is gray you’re logged out or do not have that credential saved yet). In the field Dashlane will display a drop-down list for you to choose the credential you want to use. Once you've selected the login you want, we'll autofill the password linked to it. For example, if you click in the "Username" field, select your email address or username and let us do the rest. Tired of filling in registration forms for every website you sign up for? Dashlane will do all the legwork for you! Simply click in a field and choose a stored profile you want to use to populate the form. Dashlane will detect and auto-fill the fields in the form with your data. If nothing appears, you're logged out or need to add data to the 'Personal Info' tab here or in the Wallet portion in your Dashlane app. When you connect Dashlane to all of your devices, you're able to add, access and manage credentials from anywhere and any device. 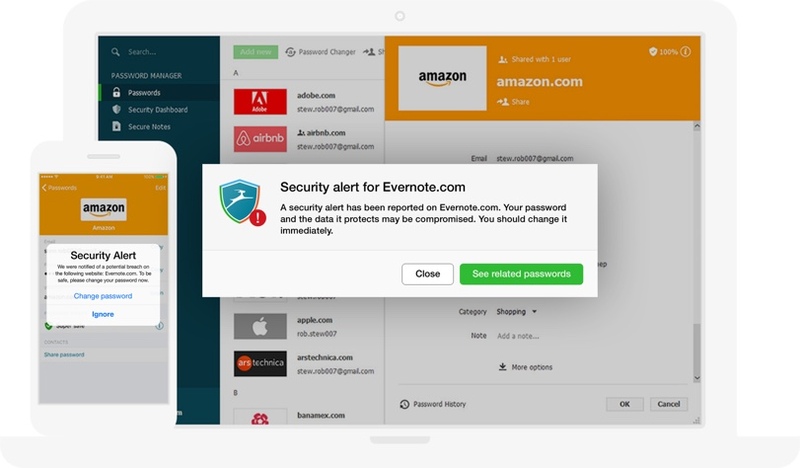 Click below to get Dashlane on your desired devices. Syncing is only available for Premium users. For more information on syncing your Dashlane data, please click here. Breaches happen so frequently and we think you should be the first to know if your account has been potentially compromised. We'll send you an alert if a hack is linked to an account you store in Dashlane and prompt you to change that password and any other accounts using that same password. The reason why you might have created weak or reused passwords in the past is because you couldn't remember unique and complex ones. Now that you have Dashlane to remember them for you, you can start updating those weak or reused passwords. We have tools that will help you do this easily. Password Changer gives you the option to automatically change passwords for compatible accounts in seconds without ever leaving the app. Password Generator is a tool automatically available during new account creation that asks if you want to generate and save a complex password, no thinking required. You can also use it to generate random passwords for existing accounts. 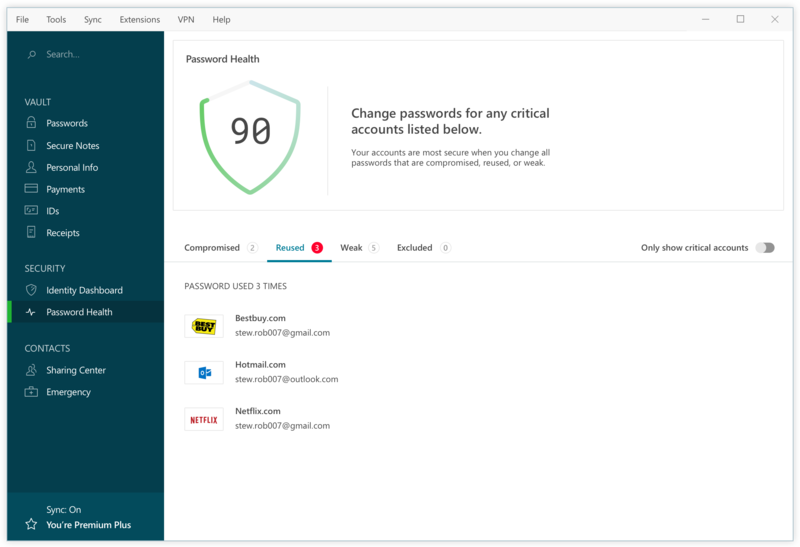 Password Health lets you see your overall password health score and a detailed breakdown of your compromised, reused, and weak passwords. To learn more, read How to use Dashlane to find out how secure you are.